Xbox game, Twin Blades in action on Windows Phone 7 (prototype from Samsung ). Man! I want one of these Windows Phone 7. See the prototype of Windows Phone 7 from Samsung! I would like one! See the 140 most influential people on twitter, using a graph. What is EXIF info? It is additional information added to the photo (jpeg/jpg/raw) by digital camera. 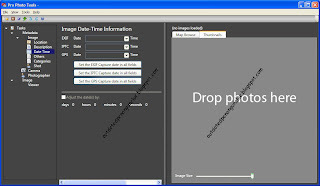 Depend on your camera, the EXIF will cover info such as camera manufacturer, model number, data and time, exposure, etc etc. My mum got a new digital camera from Panasonic, not sure either the shop that sell the camera or the friend who help my wife to set it up, he/she set the time to be 12 hours slower. Obviously he/she didn't notice the AM/PM or 24 hours setting. Anyway, after getting the camera, I also didn't check, and start away taking photos. Until I copy the pictures into my computer, then I notice that the time are incorrect, because all 12 hours slower. Not only the file's time and date, but the EXIF info as well. I don't like this happen, because usually I sort my photos during the time and date they taken. So I went to google around. And I found 2 useful software and they are freeware. Not only you can edit the date and time of your photos' EXIF info, you can do it in bulk. The best feature that I like about this software is all I need to do is to adjust the time different I want to change. Example, all the photos I took on my mum's camera was 12 hours late, so I use the "Adjust the date(s) by:" to add in 12 hours. Although Microsoft Pro Photo Tools 2 able to edit the EXIF, once I save them, the date and time changed to current date and time, which I don't want. So I found this piece of software to change the create/modified/accessed date of the pictures to the exact date and time you want. Also you can do it in bulk. It can modify for any file, not only pictures. Yes, it is free. 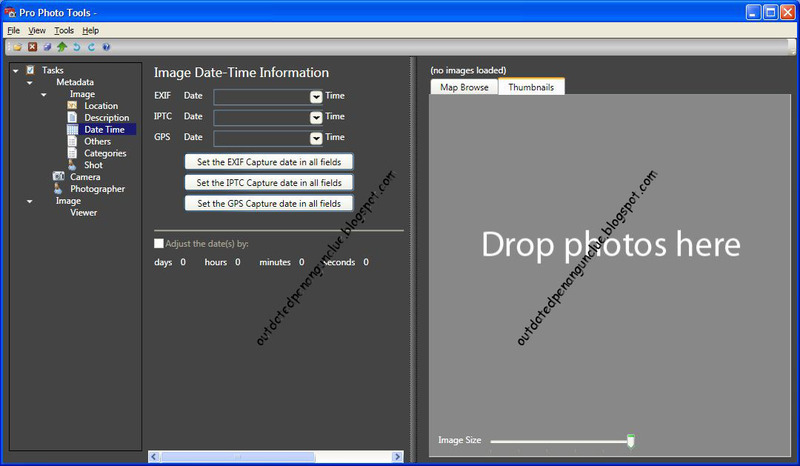 However it is lack of the feature like MS Pro Photo Tools 2 to adjust the date and time by adding the days/hours. But good enough for me, because I have a small bunch of them to edit only. Apple sue HTC, now HTC sue Apple. HTC also came out a new video, telling people that they are the one who do smartphone first. p/s: see also why Apple is success although iPod/iPhone/iPad are substandard products! It's no exaggeration to say I've been overwhelmed by the response to my post on why you should quit Facebook. To those of you who shared your stories about leaving, or took the time to clarify some of the reasons for doing so, thank you. Apparently, I was hardly alone in making the decision to quit, or at least seriously considering it. It has been nothing short of inspiring to read your comments and realize how many of you cared enough to take action, whether it was actually deleting your account or simply taking the time to share your thoughts. Tens of millions of people provided personal information to Facebook with the understanding that this information was being shared only within their social network. Then Facebook changed the rules and this information was unexpectedly shared with perfect strangers. That is, simply stated, a profound invasion of privacy. In the United States, the Fourth and Ninth Amendments to the Constitution, along with numerous landmark Supreme Court cases, have established privacy as a fundamental right. Consider the example of the government tapping your phones. You conduct phone conversations thinking that they're just between you and the person you're speaking with. The government can't tap your phone and listen in on the conversation without a warrant. This is because your privacy is a right protected by law. I haven't even touched on the various reasons people might want to keep these conversations private. They range from the profound, like avoiding workplace discrimination, protecting political dissidents or avoiding an abusive husband, to the banal, like cheating on your wife. But it really doesn't matter. It is not for any of us to decide on behalf of someone else what information should be considered private. Most people just want control over what they're sharing and with whom. They have a right to make that choice. And many Facebook members did make that choice, only to find that, after the fact, Facebook made a different choice on their behalf. In the telecom industry, that's illegal. Yet in the social networking space, where far more information is being shared, it's not a big deal? Just don't share your personal information. Or, if you do, don't use any applications and learn to use the privacy settings. Maybe that works for you, you fabulous geek, you. But are all of your family and friends as clever as you are? What are the odds that the majority of Facebook members will do these things? Uh, okay. Somewhere between not sharing personal information and actually using fake data, we cross a line into "what's the point?" That's true. Of course, that's true for any social network with a critical mass of people on it. But it's a circular justification. Once people switch to another network, it's useless for marketing. This is a tough one. I wrote my original post for exactly this reason - to try and convince them to leave. I felt that by continuing to use Facebook, I was passively endorsing it. I am not aware of any good solutions for privacy in social media. Facebook has expressly moved away from providing one. But there are plenty of good opt-out solutions. Twitter works fine for status updates. For photos, we've had Flickr for years. For video, YouTube. For link sharing, Digg. I've picked these because they are all independent companies, but there are dozens of solutions for sharing social media. The nice thing about decentralizing control over your data is that you aren't at the mercy of any one company. In fact, you could make a pretty good argument that the Web itself is the real social network. I'm not trying Mr.Zuckerberg in court, I'm selecting a service provider. The burden of proof is on Facebook here. If the head of a major bank is accused of embezzling or a teacher is accused of molesting a student, they're usually summarily fired. They may have been entirely innocent, but the standard for holding a position of responsibility is much higher than that for simply not going to jail. Mr.Zuckerberg has been accused of reading people's private emails, and he runs a social networking company. Also, keep in mind, Facebook also settled out of court in a related case for a significant sum of money, lending some weight to the allegations. If Facebook and Mr.Zuckerberg wanted to clearly establish their innocence, they could have chosen not to settle out of court. Some people in this world are just too free to do things that are not contributing or not yielding anything at all. But for the sack of fun, here you go. A XDA member managed to port Quake3 to Nexus One with high frame rate! See the video demo below. See more detail at the website. The Secret to Apple's success, ~18 mins of video. You might have heard that iPhone 2G have been hack to run Android. Now this guy pull it again, this time with iPhone 3G! See the video demo. No sound and cannot be download yet, but I think soon this will be solved and released to public. What you gonna do now Steve? HEHEHEHE. You have see my PC/laptop life saver series, but now you want to get rid a file forever, because of confidentiality or any other reasons, you don't want anyone to recover the file, ever. There are a few commercial software that can do the job, but I think the freewares that I want to introduce will be good enough to do the job. With File Shredder you can remove files from your hard drive without fear they could be recovered. 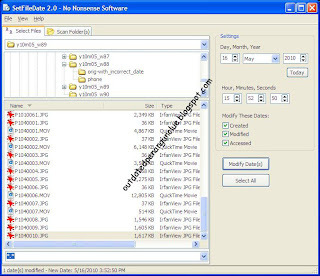 There are quite a few software tools today for retrieval of deleted files under Windows OS. Those tools, often referred to as "file recovery" software, are taking advantage of shortcoming of Windows "delete" command that we all use regularly to delete files. Actually, the "delete" operation in Windows only removes bits of information from files so they appear deleted in OS. It is easy to retrieve those files using aforementioned specialized file recovery software. In order to remove, or shred files permanently from your system you have to use a program that is capable of rewriting the files with random series of binary data multiple times. This process is often called shredding. That way, the actual content of the file has been overwritten and the possibilities to recover such a shredded file are mostly theoretical. A build-in function of spybot will also shred the file forever from your hard drive. This is also a freeware. p/s: Visit my posting regarding recover file, but if you shred it using above methods, there is no way to recover the file back. For those Diablo lovers and would like to play it everywhere, now you can play it on your PPC. Go to Mobilism forum to find out the detail. It has the list of versions available for you to download. Update 13 (Jan 05, 2010): It is up now! 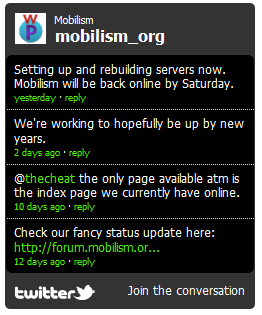 Update5 (Nov 19, 2010): I haven't login to Mobilism for quite a while, noticed that it was down last week because of hacker's attack. It is back online now, but I have problem to post reply on it, could be my FireFox, or something else. For you all, check it out your self. Update 2 (Jul20, 2010): I found an android forum talking about mobilism down because DNS problem, so I tried the ip http://93.174.93.90/ but it didn't work as well. Too bad. Update (Jul20, 2010): I can't access the site. Not sure why. Anyone know? Please inform me at the comment. After some reflection, I've decided to delete my account on Facebook. I'd like to encourage you to do the same. This is part altruism and part selfish. The altruism part is that I think Facebook, as a company, is unethical. The selfish part is that I'd like my own social network to migrate away from Facebook so that I'm not missing anything. In any event, here's my "Top Ten" reasons for why you should join me and many others and delete your account. Let's start with the basics. Facebook's Terms Of Service state that not only do they own your data (section 2.1), but if you don't keep it up to date and accurate (section 4.6), they can terminate your account (section 14). You could argue that the terms are just protecting Facebook's interests, and are not in practice enforced, but in the context of their other activities, this defense is pretty weak. As you'll see, there's no reason to give them the benefit of the doubt. Essentially, they see their customers as unpaid employees for crowd-sourcing ad-targeting data. From the very beginning of Facebook's existence, there are questions about Zuckerberg's ethics. According to BusinessInsider.com, he used Facebook user data to guess email passwords and read personal email in order to discredit his rivals. These allegations, albeit unproven and somewhat dated, nonetheless raise troubling questions about the ethics of the CEO of the world's largest social network. They're particularly compelling given that Facebook chose to fork over $65M to settle a related lawsuit alleging that Zuckerberg had actually stolen the idea for Facebook. At the same time that they're telling developers how to access your data with new APIs, they are relatively quiet about explaining the implications of that to members. What this amounts to is a bait-and-switch. Facebook gets you to share information that you might not otherwise share, and then they make it publicly available. Since they are in the business of monetizing information about you for advertising purposes, this amounts to tricking their users into giving advertisers information about themselves. This is why Facebook is so much worse than Twitter in this regard: Twitter has made only the simplest (and thus, more credible) privacy claims and their customers know up front that all their tweets are public. It's also why the FTC is getting involved, and people are suing them (and winning). When Pete Warden demonstrated just how this bait-and-switch works (by crawling all the data that Facebook's privacy settings changes had inadvertently made public) they sued him. Keep in mind, this happened just before they announced the Open Graph API and stated that the "default is now social." So why sue an independent software developer and fledgling entrepreneur for making data publicly available when you're actually already planning to do that yourself? Their real agenda is pretty clear: they don't want their membership to know how much data is really available. It's one thing to talk to developers about how great all this sharing is going to be; quite another to actually see what that means in the form of files anyone can download and load into MatLab. At this point, all your data is shared with applications that you install. Which means now you're not only trusting Facebook, but the application developers, too, many of whom are too small to worry much about keeping your data secure. And some of whom might be even more ethically challenged than Facebook. In practice, what this means is that all your data - all of it - must be effectively considered public, unless you simply never use any Facebook applications at all. Coupled with the OpenGraph API, you are no longer trusting Facebook, but the Facebook ecosystem. Even if we weren't talking about ethical issues here, I can't trust Facebook's technical competence to make sure my data isn't hijacked. For example, their recent introduction of their "Like" button makes it rather easy for spammers to gain access to my feed and spam my social network. Or how about this gem for harvesting profile data? These are just the latest of a series of Keystone Kops mistakes, such as accidentally making users' profiles completely public, or the cross-site scripting hole that took them over two weeks to fix. They either don't care too much about your privacy or don't really have very good engineers, or perhaps both. It's one thing to make data public or even mislead users about doing so; but where I really draw the line is that, once you decide you've had enough, it's pretty tricky to really delete your account. They make no promises about deleting your data and every application you've used may keep it as well. On top of that, account deletion is incredibly (and intentionally) confusing. When you go to your account settings, you're given an option to deactivate your account, which turns out not to be the same thing as deleting it. Deactivating means you can still be tagged in photos and be spammed by Facebook (you actually have to opt out of getting emails as part of the deactivation, an incredibly easy detail to overlook, since you think you're deleting your account). Finally, the moment you log back in, you're back like nothing ever happened! In fact, it's really not much different from not logging in for awhile. To actually delete your account, you have to find a link buried in the on-line help (by "buried" I mean it takes five clicks to get there). Or you can just click here. Basically, Facebook is trying to trick their users into allowing them to keep their data even after they've "deleted" their account. The so-called Open Graph API is named so as to disguise its fundamentally closed nature. It's bad enough that the idea here is that we all pitch in and make it easier than ever to help Facebook collect more data about you. It's bad enough that most consumers will have no idea that this data is basically public. It's bad enough that they claim to own this data and are aiming to be the one source for accessing it. But then they are disingenuous enough to call it "open," when, in fact, it is completely proprietary to Facebook. You can't use this feature unless you're on Facebook. A truly open implementation would work with whichever social network we prefer, and it would look something like OpenLike. Similarly, they implement just enough of OpenID to claim they support it, while aggressively promoting a proprietary alternative, Facebook Connect. Between the farms and the mafia wars and the "top news" (which always guesses wrong - is that configurable somehow?) and the myriad privacy settings and the annoying ads (with all that data about me, the best they can apparently do is promote dating sites, because, uh, I'm single) and the thousands upon thousands of crappy applications, Facebook is almost completely useless to me at this point. Yes, I could probably customize it better, but the navigation is ridiculous, so I don't bother. (And, yet, somehow, I can't even change colors or apply themes or do anything to make my page look personalized.) Let's not even get into how slowly your feed page loads. Basically, at this point, Facebook is more annoying than anything else. Facebook is clearly determined to add every feature of every competing social network in an attempt to take over the Web (this is a never-ending quest that goes back to AOL and those damn CDs that were practically falling out of the sky). While Twitter isn't the most usable thing in the world, at least they've tried to stay focused and aren't trying to be everything to everyone. I often hear people talking about Facebook as though they were some sort of monopoly or public trust. Well, they aren't. They owe us nothing. They can do whatever they want, within the bounds of the laws. (And keep in mind, even those criteria are pretty murky when it comes to social networking.) But that doesn't mean we have to actually put up with them. Furthermore, their long-term success is by no means guaranteed - have we all forgotten MySpace? Oh, right, we have. Regardless of the hype, the fact remains that Sergei Brin or Bill Gates or Warren Buffett could personally acquire a majority stake in Facebook without even straining their bank account. And Facebook's revenue remains more or less a rounding error for more established tech companies. While social networking is a fun new application category enjoying remarkable growth, Facebook isn't the only game in town. I don't like their application nor how they do business and so I've made my choice to use other providers. And so can you. Facebook getting annoying is it? See what happen if your "long time no see" friends start to "poke" at you in real life, HAHAHA. Use the website below to check your HTC phones/smartphone/ppc is genuine or not! Some places might be selling re-furbished phones from other country, but they told you it is a new phone. You will need your IMEI number (dial *#06# to get this number) and serial number to check.